Jeremy White is the executive editor of innovation magazine WIRED and at the forefront of seeking out cutting edge technology trends. 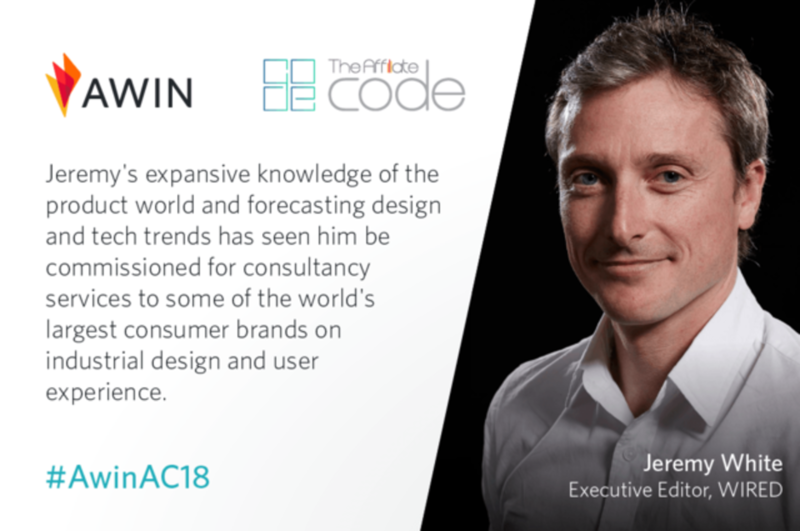 With credentials that have led to him consulting for some of the world’s largest consumer brands, Awin look forward to welcoming Jeremy White as a keynote speaker at one-day conference, The Affiliate Code, in London this June. Jeremy will introduce the megatrends happening in the technology space, as well as how they are being used in commerce and consumer goods. “This is what’s happening right now, even if you may not be aware of it” Jeremy explains. “AI is being used in all manner of industries – it has even helped to change the taste of lager for one brand,” he says. Jeremy will explain how AI helps businesses move more quickly and how they can have a better relationship with their clients. The tech expert will also note the recent shift in corporate structures and rise in incubator programmes. Want to know your Artificial Intelligence from the Internet of Things and Quantum computing? Register for The Affiliate Code and get a head start on the tech trends of the present and future.